WASHINGTON, Jan. 15, 2019 /Christian Newswire/ -- The eleventh annual Marist Poll on American attitudes toward abortion finds that overwhelming majorities support substantial restrictions on abortion, and would like to see Roe v. Wade reinterpreted to allow restrictions. 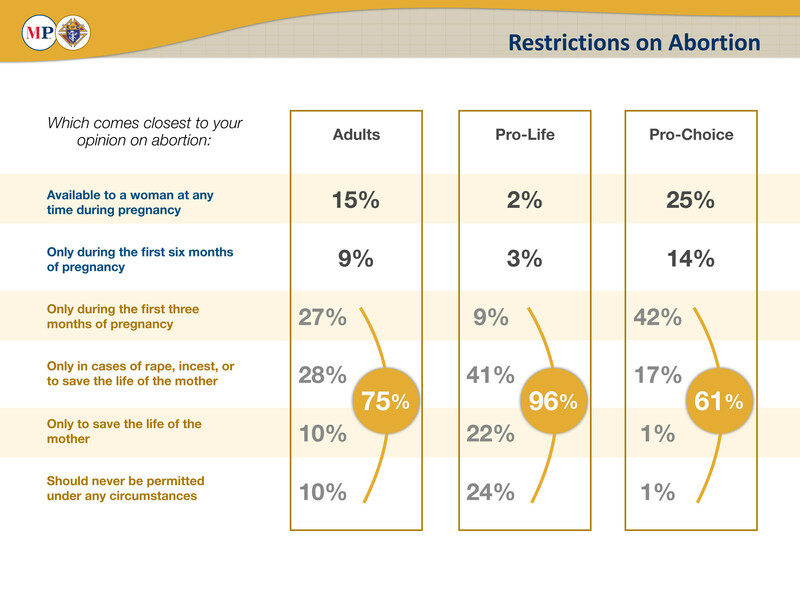 Three in four Americans (75 percent) say abortion should be limited to – at most – the first three months of pregnancy. This includes most of those who identify as Republicans (92 percent), Independents (78 percent) and a majority of Democrats (60 percent). It also includes more than six in 10 (61 percent) who identify as pro-choice. The survey also found that by more than 20 points, a majority of Americans believe that "scientifically" a fetus is "a unique life" (56 percent), while only about a third (35 percent) believe it is "part of a woman's body." A plurality of Americans say that life begins at conception (42 percent), while only about one in 10 say life begins at birth (13 percent). And by a margin of more than eight to one, most Americans also believe that laws can protect both the mother and her unborn child (83 percent to 10 percent). "As in past years, this poll shows that the pro-choice label on the abortion issue is simply insufficient," said Knights of Columbus CEO Carl Anderson. "The majority of Americans – in both parties – support legal restrictions on abortion. Two-thirds of Americans want Roe revisited to allow for state regulation of abortion or to ban it altogether. The majority of the American people deserve to have their opinions heard." The Knights of Columbus is one of the nation's premiere volunteer and charitable organizations. In 2017, Knights worldwide donated more than 75.6 million hours, and more than $185 million to charitable causes in communities throughout the Americas, as well in Europe and Asia. From helping children in need, to providing wheelchairs for the disabled, to helping stock food banks, to offering top-rated and affordable life insurance to its members, the Knights has been at the service of the community for more than 130 years, and is the world's largest Catholic service organization.